What have I been up to lately? I’ve been reviewing books, like a crazy person! Some will be utilised in the newsletter I’ve mentioned previously, but mostly, I’m adding them here as a resource for other stitchers. They are, of course, just my opinions, not a definitive guide! But craft books, although amazing resources, are a huge expense, and I’d like to think that my humble opinions might help someone make a decision on what to invest their hard-earned cash in. It can be difficult to find pre-purchase information, especially for older books that are now out of print. I have to confess that in the past I have taken a lot of chances, based on a cover illustration or even just a title. Occasionally, I have been disappointed, but I’ve also made some amazing discoveries this way. Of course, we are all looking for different things, so I have tried to pinpoint what it is I specifically appreciate about the different books, and what I felt disappointed by – because the exact same things may elicit the opposite response from you. Please feel free to add comments if you agree or disagree with any of my reviews. If nothing else, it has been a very pleasant stroll across my bookshelves (by no means anywhere near complete as yet, and, of course, ever-expanding!) . I have discovered entire books I had forgotten about, not to mention sectons of books I had skimmed over in the past but have discovered anew, as my interests have developed over the years. The ‘book review index’ link to the right will give you an A-Z list of all the different reviews, and link you to the page where you will find that review. You will see the reviews are also listed by category/technique. If a book could be filed under several categories, I have chosen a main ‘home’ for it, but also included links under other relevant categories. The number at the side of the category link refers to the number of books currently reviewed (or linked) within it – this way you can see when a new book has been added in your favourite category. Anything else I should include? Let me know! In the meantime, I hope you enjoy browsing my bookcase! The long train journeys yesterday gave me the luxurious opportunity to actually spend some time stitching, so I started working on the canvas work (/needlepoint) adaptation of my Noro knitting wool oak leaf design (see earlier entry for pic). This time I used 18ct canvas and Carrie’s Threads 6-ply cotton, which has given me a little more flexibility with the design, in terms of both colours and stitches. I’m really pleased with the ‘knobbly’ effect of the acorn cups, and I think the purples work well as a contrasting background colour to the autumnal greens. I’m stitching the background area in freeform bargello. 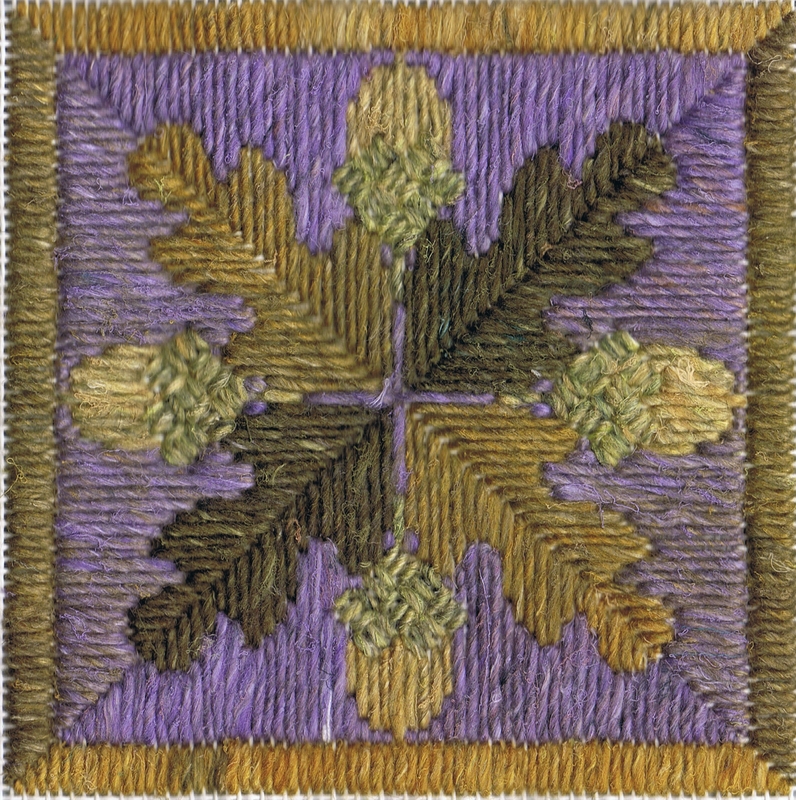 By this I mean that instead of following a fixed, charted (or standard) bargello pattern, I have actually used the base lines of the oak leaves as the starting bargello line, so that the background complements the foreground & emphasises its natural contours, rather than detracts with an entirely independent pattern. In terms of bargello, I am ignoring the acorns, and just following the contours of the leaves to avoid unnecessary complication in the pattern. 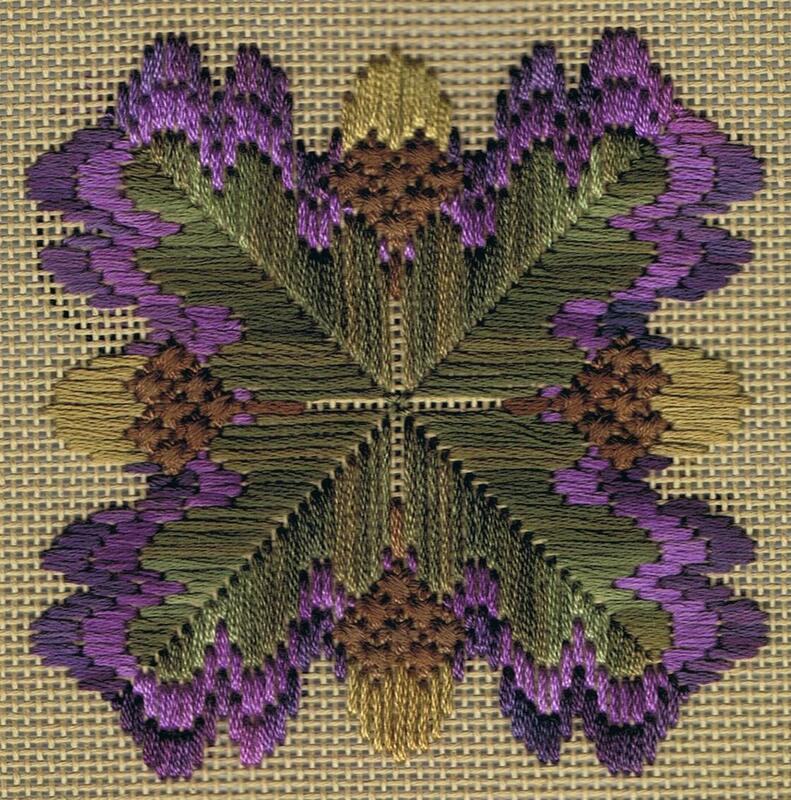 It’s a very relaxing form to work, as once the central design has been stitched (which in itself doesn’t take an incredible amount of reference to the chart given its 4-way repeat) there’s no need to refer to a chart at all – you literally just stitch the bargello around the outer edge of the leaves. I stopped after 2 rows, as I need to work out the placement of the border before I continue – but it was an ideal project to work on while travelling. I must confess I am a little annoyed with myself, as I got married earlier this year, and the theme of our wedding stationery was oak leaves (based on a verse about the oak and the cypress from Kahlil Gibran that we used in our vows). I had wanted to stitch a design to use, but at the time – with all the other wedding organisation pressures – I just didn’t have the time or inspiration. In the end, I drew a design, instead, which is – actually, essentially, anyway – a freeform bargello design, and we used the coloured ink drawing onthe stationery, instead. I’m annoyed now, because I seem to have oak leaf stitch patterns practically dripping from my fingers – I just couldn’t do it at the time when it would have been quite appropriate. Still, it doesn’t mean I can’t go back to the wedding stationery design and re-interpret it for stitch now, and I hadn’t thought about that until I began writing this, but I think, actually, I will. That’s that settled, then! My ‘day job’ is working for the biggest chain book store in the UK, which I’ve done for the last 12 or more (count ’em!) years. Reading is that thing I do, when I’m not stitching. One of the perks of the job is that we often get advance copies of new books (although these aren’t available for ALL titles). I go on the local BBC radio once a month to talk about new fiction titles, I review for the company’s quarterly, national magazine, and I produce a bi-monthly local store newsletter, too. All of these things focus on fiction, but I thought it would be nice come Autumn to do a special edition newsletter, specificaly on craft books, because there are some great books out there, but it’s not something our stores are generally very big on. So I decided to be a bit cheeky, and contacted Search Press, asking if they would be able to supply an advance copy of one of their new titles, for review. Before I knew it, they had contacted our head office & asked if my newsletter could have wider distribution, & head office contacted me to say that was a great idea. So today I have a long day trip to Brentford, where amongst other things I will be able to discuss the distribution (&, I hope, growth) of the newsletter , which in turn may lead to a nationwide expansion of interesting books available in the craft section of your localbook store! I had no idea my little email would have quite such a domino effect, but it’s all very exciting! I’m very excited about the newsletter, though. It may only be a newsletter, but it’s a way to combine my two loves in my paid work.I really can’t complain about that! I don’t know if I’m legally allowed to post pics of somebody else’s work, but just in case, here are the links to the work of two different designers, both producing stunning charts and kits for graduated blackwork. I haven’t stitched from somebody else’s kit for years, but I will be purchasing from both! I have been inspired to go back to blackwork embroidery after a long absence. I don’t think I can produce anything as impressive as these, but it’s going to be fun to experiment, too! Years ago, I found a blackwork kit at one of the big needlework shows in London. It was by a company called Needle Needs, and the design was a cat’s face, called ‘Tabatha’. It was beautiful, very detailed and delicately graduated to convey all the shading accurately. I no longer own the stitched piece, and although I once had a photo on my PC, several house moves & a PC change later, I can longer find that either. The company does not seem to existny longer, and on this vast world wide web, I can’t find any other images of the design, either. Oh, well. It ruined me for blackwork. It was one of the first blackwork projects I stitched, after a couple that were much smaller. I loved the design too much to be daunted by its complexity. After that, though, I could never find another blackwork piece approaching the same level of design quality and moved on to her stitch techniques. The market has grown a little, since then – although graduate blackwork is still not exactly common – and there are some good designs about (Derwentwater to some interesting landscapes in blackwork using different colours; and Tanja Berlin has some stunning peacock & butterfly designs); but like I say – the stitching ship has sailed, for me. What ‘Tabatha’ did do, was inspire me to experiment with graduated blackwork myself. I did a few small pattern studies, then leaped straight in to try charting my own cat, ‘Colin’. I’ve lost the original photo I worked from, but I’ve added a pixelated cross stitch chart version below, as well as one of the variations of a blackwork version (I did a few, using different filling patterns, as the patterns make quite a difference to the overall effect). I didn’t really pursue the idea any further. ‘Colin’ was no competition for ‘Tabatha’, and my own stitching was leading in different directions, anyway. Recently, though, the subject of cats (and blackwork) came up with a couple of my model stitchers, so I sent through a couple of my old charts of ‘Colin’ – completely without instructions; I had had no thoughts or intention of kitting them at all. The charts were well-received by both stitchers – one of whom suggested an idea to me that had never crossed my mind, but actually, is very worthy of consideration. In the meantime, though, I’m going to give it a trial run, and see what happens. I don’t know that commission work is necessarily a direction I want to go in, but I’ll see if I can recreate the apparent success of ‘Colin’ before I need to think about making that decision. I always stitch with overdyed threads. I do this because I like them. I love the serendipity of the colour placement, and the fact that a piece stitched from the same pattern will be different every time. If you have a symmetrical design, you can take care with the threads (sometimes starting a new length before you have finished the last) so that the colours fall in the same place on a mirrored image, or you can just stitch as the thread comes and see what happens. I think I’m unusual in that I ONLY stitch with overdyed threads, but at the same time, I do appreciate from a design perspective that a plain/solid colour can be the best way to enhance and complement an overdyed shade. But there are so many types of overdyed threads around these days that I can get around this. Some overdyed threads have quite dramatic, contrasting colour changes; others are far subtler, and often only have very minor variations within one shade of the same colour (sometimes not even as dramatic as light to dark). Therefore, I simply pair a more dramatic colour scheme with one in a shade of minimal contrasts, and then neither shade is compromised. Subtle shades can usually be stitched together without danger, but more dramatic colour combinations stitched within one piece can either clash, or just look messy. Serendipity is one thing, but the point of design is to harness a thread’s special features, and makes its character workfor, rather than against you. Which brings me to my point, really. Now personally, I’m not a big stitcher of cross stitch (although I have done quite a lot in the past) but I do enjoy designing cross stitch, and I love to see the finished results – especially if someone else has done the stitching! BUT when I create a design, I visualise in my head how it would look if I had stitched it myself. When we are talking about overdyed threads (which we are) and somebody else stitching the design, it would be rare for a stitcher to automatically stitch it in the same way that I would myself and therefore come close to my visualisation. This leaves me with something of a quandary. Should I give the model stitcher guidance on how I would like the finished piece to look? I have decided yes, I should. Because although everyone else who stitches the design might stitch it in a different way and therefore have a different visual end result, at least I have demonstrated the design as it matches my own vision. But then, should I give the same guidance within a kit so that subsequent stitchers can replicate the design as closely as possible to the model stitcher’s version? Or should I leave out the additional stitch guidance, and allow the stitcher to make her own choice of style? My instinct is to go with the latter as I don’t like to be dictatorial, nor do I want to encourage stitchers to be sheep, capable only of replication and not original thought. The tagline to my business name, TangleCrafts, is ‘Explore, experiment, enjoy!’ because that is exactly what I want people to do. We are talking about creative people – those people who, in their leisure time, simply want to create. Of course I shouldn’t talk down to them. The quandary lies in the fact that many people see a design and buy a kit because they DO want to replicate it exactly. If I have left the design unguided, then I have given the stitcher the choice of whether they wish to replicate or innovate. But I have hereby made the assumption that they already have the relevant knowledge in order to make that informed decision. Given an unguided design, it is possible they will neither know how to translate it into the cover design they have seen, nor how to put their own stamp on it. 1. ONLY chart with guidance on how to replicate the cover design. 2. Chart with replication guidance PLUS a chart for the same design that is open to individual interpretation. 3. Chart with replication guidance PLUS an open interpretation chart PLUS guidance in potential different ways to interpret the design. Perhaps I am overthinking this – it is something I do. But I think it’s an important decision to make, because the information I include within a kit sends a message to the person who buys it. Having been pondering this whole thing lately, I am more or less decided. My kits will include information to the level of point 2 above. I wouldn’t be happy only providing the information of how to replicate the design, nor would I think I had done my job as a designer if I hadn’t told them how to. Take look at the ‘Tiffany Acorns’ photo I have added below. My model stitcher, Shari, followed the guidance I provided to the letter, when she stitched this kit. Notice how the acorn pattern is echoed within itself, emphasising ts curved contours. Imagine how different this design would look if it had been stitched from left to right, right to left, leaving the effect of horizontal stripes. By no means am I saying ‘my way of stitching is better’; simply that the method of stitching makes a difference to the overall appearance, and in design terms, this must be taken into account. But rather than overload my kits with excess information – because this is an issue that is relevant to more than one of my designs, but individually, they are only small – I think I am going to produce a separate booklet. This would in essence be a beginner’s guide to cross stitching with overdyed threads, but would include some ideas for moving on a step for those stitchers already familiar with the techniques. It would also include a selection of sample patterns to practise what it preached! I could then market the booklet alongside the relevant kits, giving the individual stitchers the choice of whether they think they need the extra information or not. For me, I think this is an ideal compromise! I have ideas for various stitch techniques that would give basic information on ‘how-to’ and then progress to next-step development – basically, ideas to encourage and inspire stitchers to think creatively, rather than to be limited by charts and instructions. Amongst other things, I’m thinking about freeform and 4-way bargello, and graduated/shaded blackwork. Perhaps once all the individual thought-booklets have been produced, I could look at trying to get them published, but bound as one entire book – ‘Stitching Outside of the Box’. What do you think? I think counted thread embroidery can get a bit of bad press from the ‘arty’ embroidery community, but really, it can be every bit as creative. We stitchers are creative people, let’s celebrate that! 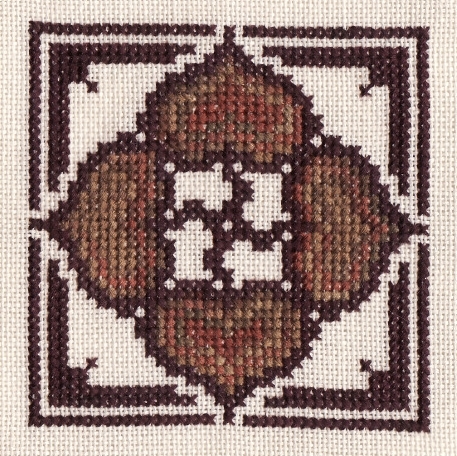 Tiffany Acorns ~ A cross stitch design, (c) TangleCrafts, 2008. Not too long ago (just a few weeks, in fact), I was sitting on my sofa and contemplating a ball of wool. As you do. Well, it was Noro wool (Kureyon), and the colours are beautiful. I bought it because I was using it for some small-scale bagweaving projects, but as needlework has come back to the fore for me lately, as I was looking at it, I started to wonder why it couldn’t be used for needlepoint. I asked around, but couldn’t find anyone who had tried it (not with Noro, at least), or could offer any practical advice re. canvas gauge for different wool types. A couple of negative replies just said no: the fibers of the wool would not stand the abrasion of the canvas, or no: the inconsistent thickness of the wool would prevent even coverage. Having already decided I wanted to try it, that wasn’t sufficient to stop me. So after thinking about it awhile, I decided to see what would happen. Guess what? It works! Okay, you have to use shorter lengths of yarn, because it will fray and break with repeated friction against the canvas. For the same reason, longer stitches (eg long stitch, satin stitch) are more successful than short or layered ones, which just fluff up – of course, you could always invent a design which embraces this feature, and then it is no longer a drawback. I actually used Noro Silk Garden, in the end, just because the colours were better suited to the design I had envisioned. Kureyon is a similar weight yarn, though, and should work just as well. I stitched onto 11ct canvas because it was what I had. Luckily, I would say this is about right. A higher gauge would definitely crowd the stitches. The satin stitch gave very even coverage on 11ct. A lower gauge canvas would probably also work, and potentially give greater flexibility in stitch variety. The yarn can withstand a little careful unpicking, but will fluff up and/or break with repeated unpicking. I cut down the yarn from the ball into lengths of about 18″ each, and separated it into colour groups. I ended up with about 10 different colours (with some variety in each ‘colour’, due to the tweeded colour blending of the yarn). I didn’t use all of them in my project – in fact, I probably had about half a ball left of unused colours, which could be easily used in another small project. I was really pleased with the results, and it was fun to work around the limitations of the quantities I had of each shade. I normally work on a much finer gauge canvas with ‘normal’ (overdyed) embroidery threads, so this was an interesting experiment for me. I can’t say I have been totally converted & will only ever do needlepoint with knitting yarn from now on; but at least now if I see a yarn in colours that inspire me, I don’t have to feel limited by what the label says it is for. It is actually a very economical way of needlepointing, as one ball of Noro wool costs around $8, whereas individual skeins of overdyed needlepoint wool/floss cost up to $5 or $6 each. To buy full skeins of each different shade I needed to stitch this design ordinarily would have cost around $30, and I would have had lots of unused thread left over so this was a bargain. I will probably create a small series of needlepoint designs specifically for use with Noro wool, taking care to ensure the colour areas are not too large (there is nothing more frustrating than finding you do not have enough of a colour to complete a particular area). 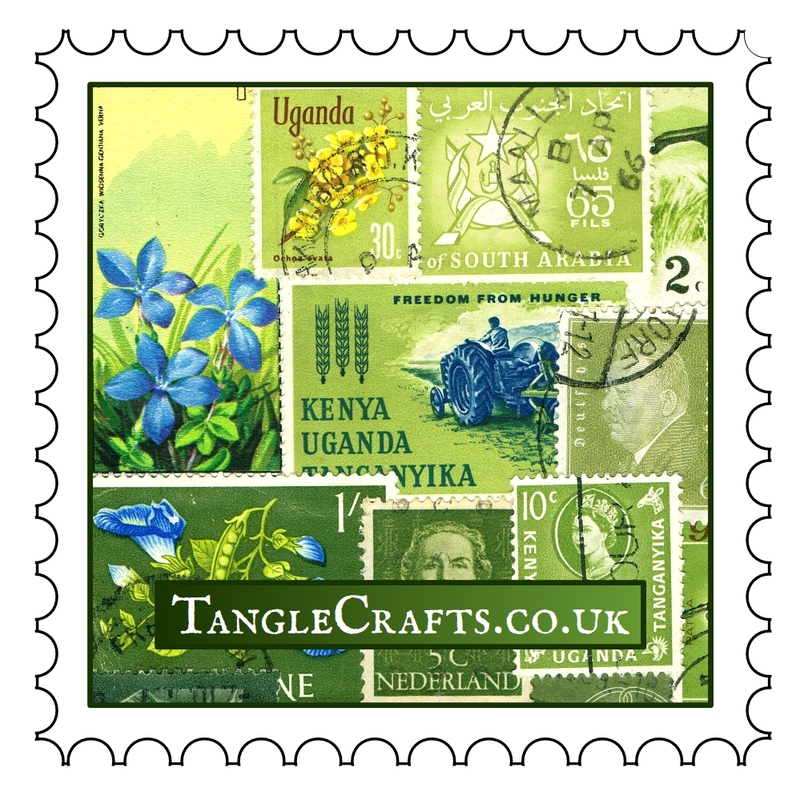 I will also be re-charting the design for ‘regular’ needlepoint, using overdyed floss on 18ct or 24ct canvas. The limitations imposed by the quantities available of each colour meant that I could not take the design quite as far as I would have wished. The re-charted pattern has an additional border around the outer edge. Oak Leaf Panel (c) TangleCrafts, 2008. Needlepoint using Noro Silk Garden 247 on 11ct mono canvas.